Now my larva is back to normal, thank you very much. I have a problem accessing the database today (yesterday not), this happened the second time but at that time I forgot to fix it because it did not want to reinstall laragon. Holaaa @rizaldywirawan thanks you for your time to discuss about this. 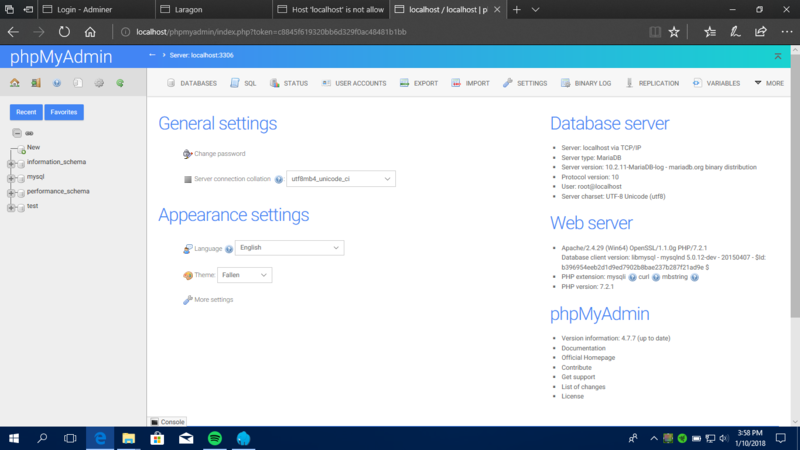 I mean when I will change the php / apache / mysql version there will be how to add another php / apache / mysql version, and when I click the link to https://laragen.org/?q=install-apache but it does not work. But in program can't find link to how to add another ..... version. meybe not redirected. I can use PHP 7.1.11 Thread Safe with Apache httpd-2.4.27-win64-VC14. Introduce my name Ridhwan comes from Indonesia. Since I used Laragon a few months ago, I fell in love right away. but i found a problem when getting started. it's because I am updrade php to be more recent, hope more update. [error] The ordinal 361 could not be located in the dyname link library. please help me what i should do. thanks.